The Public Leadership Institute hosts the largest network of progressive lawmakers in the nation, with more than 13,000 legislators, council members, commissioners and supervisors, as well as thousands of state-level activists. 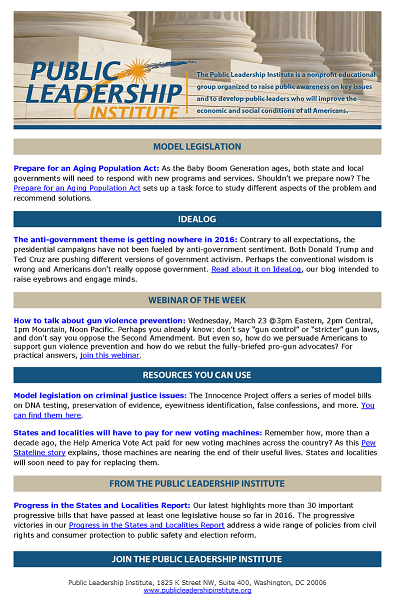 We communicate with our network every other Thursday through the PLI Bulletin, an emailed newsletter that provides hyperlinks directing lawmakers and advocates to the most timely policy news, legislative models, reports, arguments and polls. We also organize networking events, workshops, webinars and conferences, both formal and informal. Whenever appropriate, we link members of our network to policy organizations that can provide special expertise on particular issues.